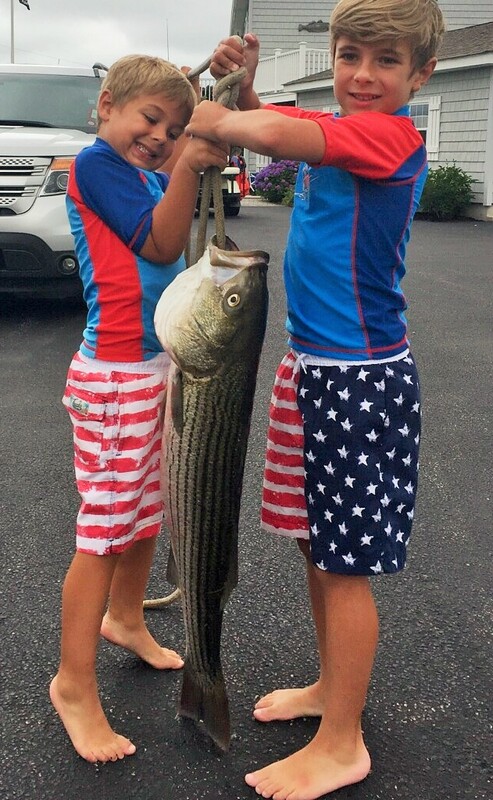 Connor Sears (11) of Seekonk, MA and Jack Leyden of North Kingstown with the 35 and 40 pound striped bass they caught at night fishing with eels on the Southwest Ledge off Block Island. Ten pound fluke caught aboard the Frances Fleet last week by angler John Topper of Bristol, RI. Effective August 11th, NOAA Fisheries closed the Atlantic bluefin tuna (BFT) angling category for large medium and giant ‘trophy’ BFT measuring 73” or greater in the Northern area. The fishery closed based on reported landings from the Automated Catch Reporting System. NOAA determined that the trophy BFT subguota has been reached and that the trophy fishery should be closed. The intent of this closure is to prevent overharvesting. The Southern and Gulf of Mexico areas closed June 7th, 2017. Catch and release fishing is permissible. Visit https://hmspermits.noaa.gov for regulations that change as category quotas are met. Summer flounder (fluke). “Fluke fishing along the southern coastal shore from Misquamicut Beach to Watch Hill has been good, particularly over rocky areas like Old Reef off Weekapaug.” said Mike Wade of Watch Hill Outfitters.” Fishing at Block Island was spotty this week. Plenty of black sea bass but you were either on or off the fluke and had to look around for them. The fluke bite in the lower bay north and south of the Jamestown and Newport Bridges was slow this week with anglers finding keepers far and few between. Capt. Frank Blount of the Francis Fleet said, “Trips were affected by little to no drift last week. This equated to buck tail set ups tipped with white or green gulp far out producing anything else. Still limit catches were recorded by a few fishers each outing. 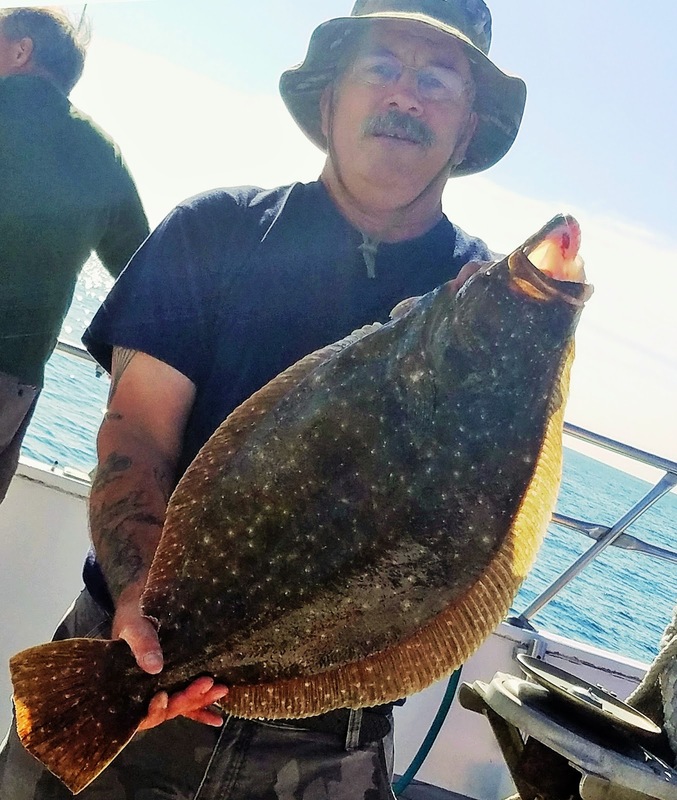 The largest fluke of the week was a 10 pound fish taken by John Topper of Bristol RI.” Fluke fishing at the mouth of the Sakonnet River has been fair. “This week the southern shore fluke bite was in about 65 feet of water off Watch Hill. The bite at the wind farm at Block Island and at the Hooter buoy slowed this week.” said Elisa Cahill of Snug Harbor. Tautog. With the fishing bite slowing down in the Bay some anglers are starting to target tautog with limited success. “Anglers are catching small fish in low water (15 feet) at rock piles along the southern shore. Not many reports of keepers caught. The fish are still in that low water.” said Elisa Cahill of Snug Harbor. Kiana Macedo of Lucky Bait & Tackle, Warren said, “We have reports of angles catching keeper tautog at Colt State Park.” “Customers targeting tautog from shore at Ft. Adams, Newport caught shorts only.” said John Littlefield of Archie’s Bait & Tackle, Riverside. Scup fishing continues to be strong in the Bay and along the coast. “Colt State Park has been yielding some nice scup for customers.” said Kiana Macedo of Lucky Bait. 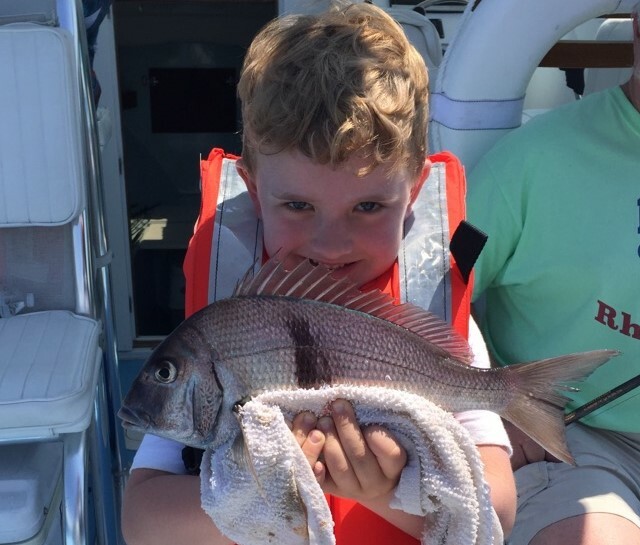 “Scup fishing has been very good all over the Bay with an awful lot of sea robins being caught too. But that has been about it.” said John Littlefield of Archie’ Bait. 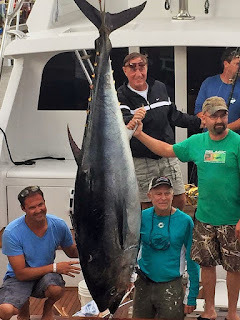 Alex Petrucci Sr (center standing), Alex Jr (kneeling to left) and their crew caught a 340 bluefin tuna using a robotic Zombait. 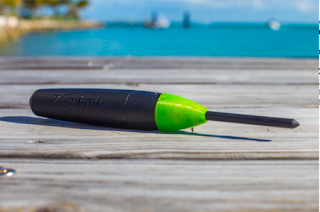 Zombait, the first robotic bait of its type, is stuck into the mouth of a dead bait fish larger than 8" to make it wiggle like a live bait. 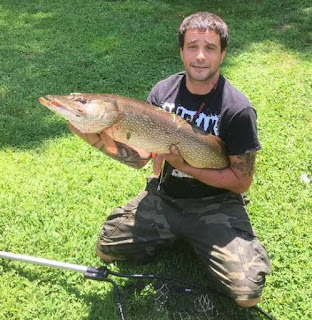 Eric Schenk with the 45” pike he caught this weekend while fishing the Blackstone River in Cumberland. 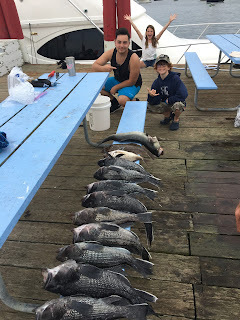 Kelly Urban from Miami with Connor Sears, Seekonk with the black sea bass and other fish they caught Monday off Block Island when fishing with Conner’s father Steve Sears and Jack Leyden. 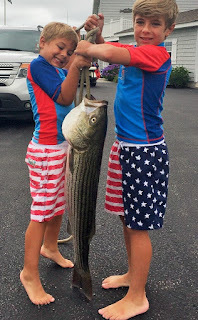 Seven year old Michael Simpson of Narragansett (right) with the 30 pound striped bass he caught in Salt Pond fishing with eels. Brother Gabe (five) on left. Brothers Jonah and Neil Ellis (on either end), grandfather Sy Janaowsky and Joe Kaufman of North Kingstown fished for fluke, black sea bass and scup this week on the Bay. “I’ve caught some pretty big bluefin in my day using all types of baits. I’ve fished with bluefish, maceral, even a large live skate behind a scallop boat with success.” said Alex Petrucci of the sport fishing vessel Duck Soup out of Pt. Judith, RI. He was talking about the 340 pound bluefin tuna he, his son Alex Jr and his crew caught at the 6th Annual Bluefin Blowout in Gloucester, MA. The Petrucci’s catching a large bluefin or other large tournament fish is not uncommon. They have been doing it for years. Alex and his family are fishing legends in Rhode Island. Two years ago they took first place in the Bluefin Blowout Tournament. But what was unusual this year, they caught a fish using a robotic bait called Zombait. To my knowledge Zombait it is the first robotic fishing lure on the market. Zombait creates a realistic, injured swimming fish to attract your prey. You simply insert this electric toothbrush looking bait into the mouth of a dead bait eight inches or larger; attach a hook and the dead bait wiggles around in the water. 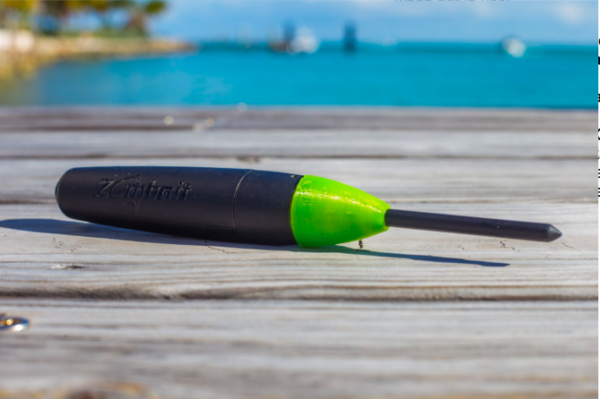 Zombait lasts about three hours on a battery charge and is good in water up to 200 feet. Visit www.zombait.com for a demonstration video on how the lure works and information about online sales. Individual units cost about $69 with a charger; a three pack with charger is $159. The Bluefin Blowout is sponsored by the Lyon-Waugh Auto Group with all proceeds from the Bluefin Blowout Auction going to the Alzheimer’s Association. The Rhode Island Department of Environmental Management (DEM) will hold its Great Outdoors Pursuit finale this Saturday at Rocky Point State Park starting with a vintage baseball game at 10:30 a.m. Family activities will run from 12 noon until 3:30 p.m. The event includes a Rocky Point-themed scavenger hunt, rock wall, lawn games, and food trucks. Educational activities, including a clamming demonstration, marine touch tank, and gymnastic demonstrations, along with informational exhibits will also be offered. This event is free and open to the public. Only registered families are eligible for prizes and give-a-ways. In addition, a double-header vintage baseball game between the Providence Grays and the New York Mutuals will take place from 10:30 a.m. to 3:00 p.m. Historically, professional baseball games were held on the grounds of Rocky Point. The most famous exhibition game took place on September 27, 1914, when the Providence Greys played the Chicago Cubs. Slugger Babe Ruth pitched for Providence and also hit a triple in that game. The Atlantic States Marine Fisheries Commission’s (ASMFC) Atlantic Menhaden Management Board approved Draft Amendment 3 to the Interstate Fishery Management Plan (FMP) for Atlantic Menhaden for public comment. The Draft Amendment seeks to manage the menhaden resource in a way that balances menhaden’s ecological role as a prey species with the needs of all user groups. To this end, the Draft Amendment considers the use of ecosystem reference points (ERPs) to manage the resource and changes to the allocation method. The amendment also presents a suite of management options for quota transfers, quota rollovers, incidental catch, the episodic events set aside program, and the Chesapeake Bay reduction fishery cap. States from Maine to Florida will likely hold public hearings on the draft amendment. Details on hearings are not yet available. Visit www.asmfc.org for a copy of amendment 3 and details on the hearings when they become available. Public comment on the amendment is open until October 20, 2017. Freshwater. Neil Hayes of Quaker Lane Bait & Tackle, North Kingstown said, “Last weekend we weighted in a 6.5 pound largemouth bass that the customer is going to have mounted last week.” “Erick Schenck an associated at Ocean State Tackle, Providence caught a 45” pike this weekend on the Blackstone River in Cumberland.” said Dave Henault of Ocean State. The trout bite continues to be slow with warm water and stocked ponds that have been fished out. However, the largemouth bass bite is fairly strong. “Offshore fishing exploded this week with a great bluefin tuna bite (the best this year so far). Customers have landed 35” to 45” bluefin from Tuna Ridge to the Northwest comer of the Dump. Most are taking them on the troll now hooking up with white Marlin as well as mahi mahi.” said Matt Conti of Snug Harbor Marina. “We have reports of bluefin as large as 90” to 110” being taken on 18” and 24” spreader bars with green machines working well. Fish are being landed from the Claw to the Dump.” said Dave Henault of Ocean State Tackle. 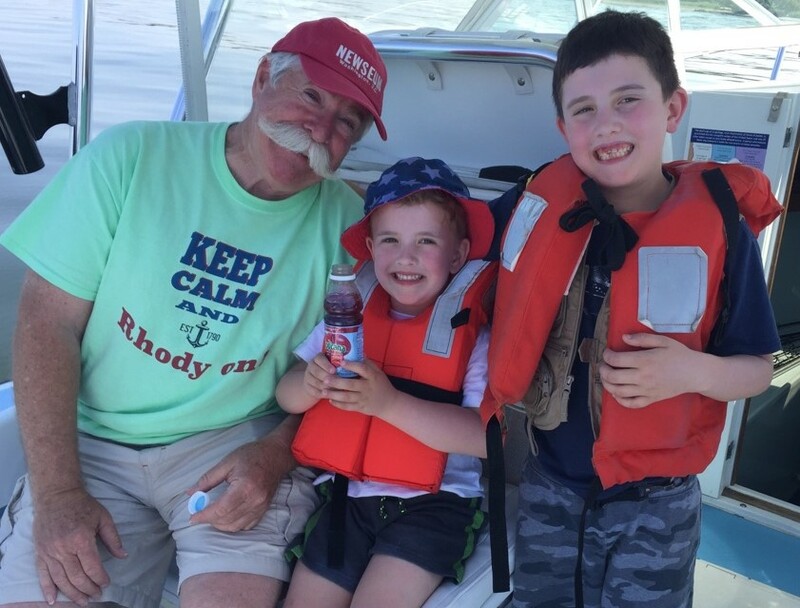 Richard Nolan of Burrillville fished Tuesday with his grandchildren Solomon and Lennox Moore. Nick Elliott of Narragansett with a 22” summer flounder he caught while fishing the deep water south of the Newport Bridge. Solomon Moore (four) of Brunswick, Maine with his prized scup. 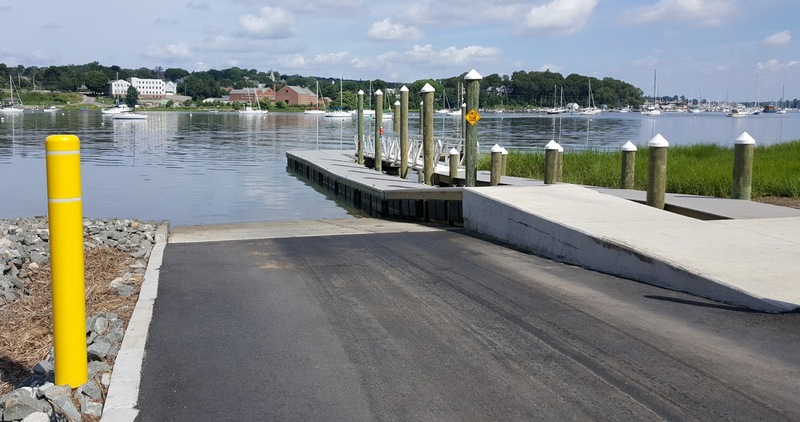 The new Goddard Park boat ramp is fully-accessible and features a new deeper water launch site. “This is the most fish I ever caught.” “Scup are great to catch.” “We’re going to make fish tacos when we get home.” These were some of the comments made Tuesday by brothers Lennox (seven) and Solomon Moore (four) as we fished Great Ledge on the north east side of the Jamestown Bridge. The Brunswick, Maine brothers were in Rhode Island with their mother Alexis visiting grandparents and could not wait to try saltwater fishing. Fishing with children is a lot of fun. No one catches a fish and is sad, particularly children. But to cultivate a child’s interest in fishing you have to tone things down and make it easy for them to catch fish. It does not have to be a large fish; small fish make children enthusiastic too. If children are not catching fish right away you can lose their interest. Here are some tips for taking children fishing. First, the trip should be planned for the children and not the adults taking them. Everyone’s energy on the vessel is geared toward the children to have them catch fish. This means kids only are fishing until they are successful. It’s all about the children. Where you fish is important, targeting ground fish that are easy to catch like scup and sea bass is important. Most children have the reflexes it takes for a quick hook set to catch scup and sea bass (faster reflexes than most adults I know). Scup tend to be where there is water movement, structure and bait so anchoring up or drifting on a ledge, near a bridge, jetty or some other structure where you have caught fish before is a good idea. You should also gear down. Use light weight rods that children can handle. I often use the lightest tackle I have (light weight spinning rods, rated for 8 to 17 pound test line) or small conventional reels and rods for children that have difficulty handling spinning reels. I also keep the fishing rig simple. Traditional scup (porgy) or sea bass rigs work well. Two small hooks and a sinker works fine. The bait is simple too, a small piece of squid. Keep things light, I once had a youngster eating cheese and crackers and he asked, “Do you think my cheese will work for bait.” We gave it a try. The decision to use the cheese kept his interest and it worked. Demonstrating how the rods and reels work is very important. I often do a general introduction at the dock and a second time when we arrive at the first fishing spot. Then it’s one on one with an adult working with each child most of the day. Children do catch on quickly. At the end of the trip Tuesday, seven year old Lennox was baiting his hook, setting the hook properly, landing fish and taking the fish off the hook. Teach children how to be responsible anglers. Obey fishing laws, practice catch and release, take only those fish children will eat, and teach them how to be good stewards of the environment. Lastly, decide if you are going to keep fish for consumption at the beginning of the trip so there is no misunderstanding with the children (some want to bring them home as pets). Encourage children to eat or at least taste the fish once it is cooked at home. Fish are a fresh, local and nutritious source of protein. Something about eating what we catch is part of our DNA as humans. I think this is an important part of the fishing experience. Freshwater fishing for trout has slowed as the water has warmed and stocked ponds have been fished out. Manny Macedo of Lucky Bait & Tackle, Warren said, “Customers are catching bass with shiners and a nice pike was caught on Blackstone River in Lincoln, RI.” Neil Hayes of Quaker Lane Bait & Tackle, North Kingstown said, “We weighted in a 6.5 pound largemouth bass that the customer is going to have mounted.” “Most freshwater fishermen are using shiners for largemouth bass. One customer fished the Turner Reservoir (Rumford, RI) and hooked up with some fish there.” said John Littlefield of Archie’s Bait & Tackle, Riverside. Striped bass. John Littlefield said, “This week we had more schools of pogies (Atlantic menhaden) presenting themselves in the upper Bay with two keepers, a 30” and 31” fish being taken at Pomham Light House.” “One customer caught a 30 inch striped bass at Popasquash Point casting SP Minnows.” said Manny Macedo of Lucky Bait & Tackle, Warren. Mike Cardinal of Misquamicut Bait & Tackle (formerly Cardinal Bait), Westerly, said “Large bass are being caught on the Watch Hill reefs with anglers live lining scup and eels as bait. 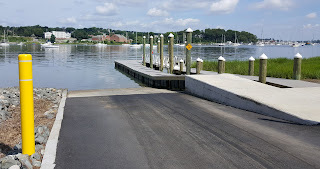 The bite from the breech ways last week was restricted to school bass.” Neil Hayes of Quaker Lane said, “We have had a good bite with eels off Jamestown and Newport and a great bite with large fish at Block Island. Customers are also trolling umbrella rigs and tube & worm with success.” Angler Eric Appolonia of North Kingstown, RI said, “Last week before the storm my son Alex and his friend boated two nice fish in the 30 to 35 pound range.” “The striped bass bite on the southwest side of Block Island is still very good with anglers catching fish with umbrella rigs as well as eels. We had some 50 pound fish caught last week.” said Matt Conti of Sung Harbor Marina, South Kingstown. Summer flounder (fluke) fishing has been good at the Jamestown and Newport Bridges.” said Ken Ferrara of Ray’s Bait & Tackle, Warwick. I fished the Newport Bridge area twice this past week and managed a few nice keeper fluke to 23” and several nice sized black sea bass to 19”. “Fluke fishing has slowed a bit along the southern coastal shore with a good bite still occurring south of Fishers Island (New York).” said Mike Cardinal. Fluke fishing around Block Island at Clay Head and the North Rip area has been good as well as at the East Fishing Grounds and the South side in 80 feet of water. As usual with fluke fishing, on any given day you have to fish a few places until you find the fish. Matt Conti of Snug Harbor said, “The bite at the East Fishing Grounds and in the wind farm area has been good with the bite slowing a bit at Clay Head. The bite is still on a bit along the southern coastal shore in about 60 feet of water.” The fluke bite at Clay Head and the East Fishing Grounds Monday was very soft when I fished there, plenty of black sea bass. Perhaps the previous day’s storm gave them lockjaw. Black sea bass bite has been good at the Newport Bridge with anglers catching them in the Bay, off the coastal shore and at Block Island when they are fluke fishing. “Scup fishing has been very good with anglers catching 10 to 15 nice fish each at Colt State park and off the bike path bridge.” said John Littlefield. Mike Cardinal said, “The scup bite is very good off the breech ways.” “With the bad weather this weekend customers have been doing a lot of scup fishing with a good bite at the Mt. Hope Bridge.” said Macedo of Lucky Bait. We caught several nice scup fluke fishing under the Newport Bridge this past weekend. Tuesday I fished the Great Ledge area off Jamestown with brothers Lennox (seven) and Solomon Moore (four) and they caught about twenty fish in two hours. Bluefish have been heavy at Block Island with anglers catching them when fishing for striped bass. Snapper blue fishing in the bays, coves and harbors improved last week. Offshore fishing. “We had two customers come in with blue fin tuna late Friday. One fish was about 33” and the second which had already been gutted weighed 104 pounds. So anglers are catching some nice fish trolling for them, casting to them and even jigging seems to be working. The bite was south of Tuna Ridge to the Northwest corner of the Dump as well as the Claw area. Customers are also still catching Mako sharks.” said Matt Conti of Snug Harbor Marina. 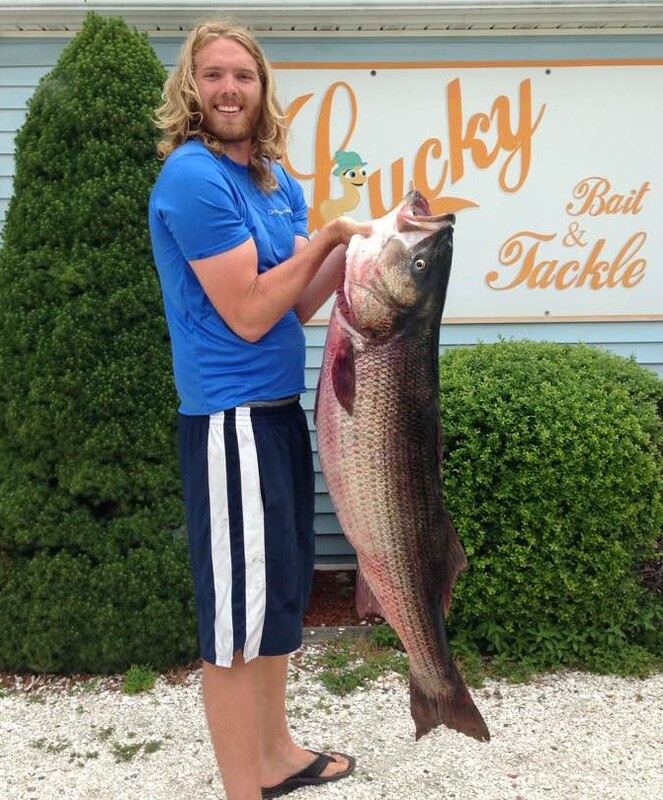 Matt Wechbacker caught this 69 pound striped bass at Block Island with an eel when fishing with Capt. Corey Smith and Kurt Rivard Friday, July 21. Rich Heffernan, Tom Wood and Larry Audino fished the East Grounds off Block Island for summer flounder and black sea bass Saturday on No Fluke Charters. Newport black sea bass bite was good for Joe Roth of Boca Raton, FL who fished the bridge area with success Wednesday. He and wife Linda were fishing with cousin Kevin Fetzer of East Greenwich. Anthony Gauthier of Washington, DC with a thick summer flounder caught off Ft. Adams, Newport. Anthony and Katie Conway (formerly of North Kingstown) married in Newport last week. In one of the first laws of its kind in the State of Rhode Island, the Cranston City Council approved a ‘No Fishing’ ordinance at the end of Ocean Avenue, Cranston at their July 24, 2017 meeting. The primary advocate for the ordinance was the Rhode Island Yacht Club, whose parking lot is adjacent to the public access fishing area. Legal Counsel for the city testified (at president Farina’s urging) that they checked with involved state agencies such as the Costal Resource Management Authority and there was nothing wrong with the City ban on fishing at the access point as long as anglers could go down to the beach to fish. Neither legal counsel nor Council president Farina mentioned the DEM letter at the Council meeting. Before the council voted on the ordinance an amendment made by Councilman Michael Favicchio was approved. The spirit of the amendment was to ban fishing on the road but allow it on the beach. The amendment further made it unclear as to where the ‘No Fishing’ line was drawn i.e. at the edge of the road where there is a guardrail, up to the beginning of the sea wall, etc. Councilman Stycos urged clarification in the amendment, but it passed without further alternation. Save The Bay, the Edgewood Preservation Association and the Rhode Island Saltwater Anglers Association all plan to urge Mayor Fung to veto the ‘No Fishing’ law. The Rhode Island Saltwater Anglers Association has also offered to help the City of Cranston and residents in the area with fishermen outreach. In the past the Association has helped the State and cities with access area signage, the posting of fishing regulations, provided fishing line disposal dispensers and fishermen communication. The Rhode Island Department of Environmental Management (DEM) announced it is hosting a series of free recreational clamming workshops this summer. The workshops, led by a local shellfisherman, review the history and value of shellfishing in Rhode Island and provide an opportunity for participants to dig for their own clams. People of all ages are encouraged to participate. Space is limited and registration is required. To register, contact Kimberly Sullivan at Kimberly.sullivan@dem.ri.gov. All equipment and materials will be provided. A workshop was held in Bristol earlier this week, the remaining schedule includes workshops on: Friday, August 11th, 3:00 p.m. – 6:00 p.m. at North Kingstown Town Beach, North Kingstown; Tuesday, August 22, 1:00 p.m. – 4:00 p.m. and Saturday, September 9, 2:00 p.m. – 5:00 p.m. at Rocky Point State Park, Warwick. Clamming (known locally as quahogging) has a rich history in Rhode Island, as a significant contributor to the state’s commercial fishing industry as well as a great family recreational fishery. More than 28 million quahogs were harvested from Narragansett Bay and local coastal waters last year. Come Clam With Me workshops are sponsored by DEM’s Aquatic Resource Education (ARE) program. ARE provides a host of recreational fishing opportunities for the public – as well as marine science programming for educators. For more information on ARE programs and events, visit www.dem.ri.gov/are. Every wonder how to select a party fishing boat to go out on and just wish you knew which one was good and best for you. You can learn how to select a party boat this Monday, July 31st, 7:00 p.m. at the Rhode Island Saltwater Anglers Association’s (RISAA) Party Boat Seminar at the West Warwick Elks Lodge. Learn what to look for when choosing a party boat, differences in boat operations as well as fishing gear and techniques to employ when fishing on a party board. Non-members are requested to make a $10 donation to the RISAA Scholarship Fund, members attend free. The Elks Lodge is at 60 Clyde Street, West Warwick. Dinner between 5:30 p.m. and 6:30 p.m. sold separately.